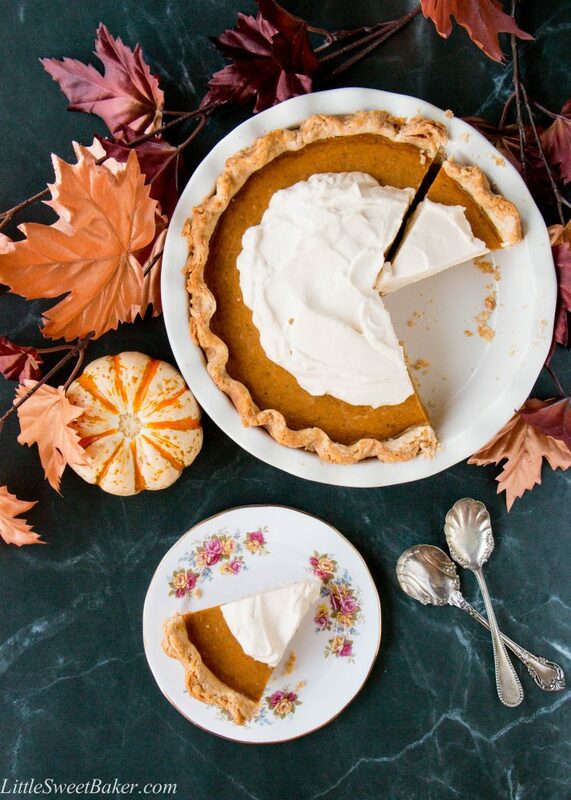 Impress your guests this holiday season with this scrumptious homemade pumpkin pie. The filling is rich, creamy, and perfectly spiced. The crust is tender and flaky, and it’s all topped with a delicious caramel flavored whipped cream. I can’t believe the Canadian Thanksgiving is just around the corner. The weather here is finally cooling down. Not that I don’t enjoy a hot summer, but I do love cozying up in my blanket when I sleep. I also love the change of the season as it turns into Fall. There is just something nostalgic about it. The air becomes cool and crisp as the leaves start to change color. Plus, you can warm up to so many wonderful things like a toasty fireplace, soft blankets, and hot chocolate, just to name a few. This homemade pumpkin pie recipe starts with a foolproof 4 ingredient flaky pie crust. You just stir all the ingredients together and roll out the pastry dough. The filling is simply canned pumpkin puree, sweetened condensed milk, eggs, pumpkin spice and salt. You mix all that together, pour it into the pie crust, and bake for 45 minutes. You can use homemade pumpkin puree if you prefer, just make sure you drain some of the liquid out so it is the same consistency as the canned puree. I like the convenience of the canned pumpkin puree. I also like the convenience of using sweetened condensed milk: that way you don’t have to add any sugar to the filling. 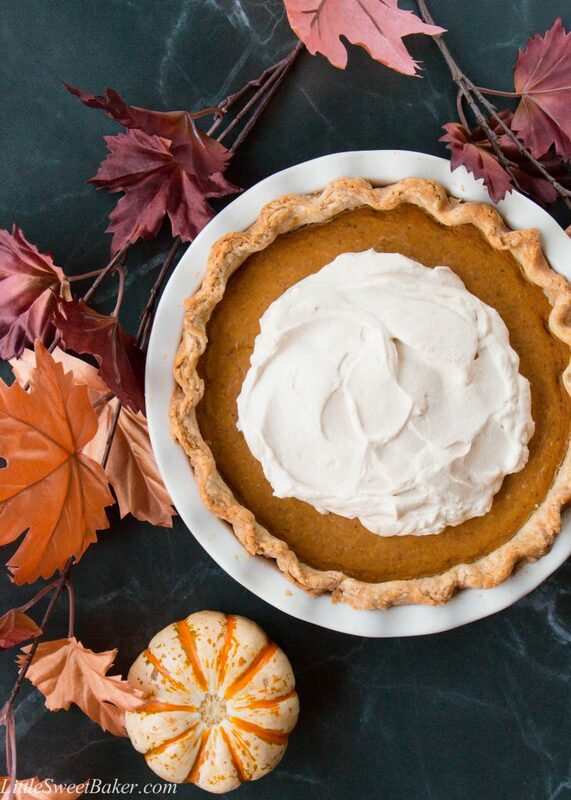 Pumpkin spice is great too because it already has the perfect blend of spices for the pie. Then lastly, the fabulous caramel whipped cream is only 3 ingredients: whipping cream, caramel sauce and salt. So the theme of this recipe is definitely easy peasy. This pie is tender and flaky. The filling is thick and creamy with a sweet pumpkin flavor. There is a beautiful aroma of cinnamon, nutmeg, and cloves in very bite. 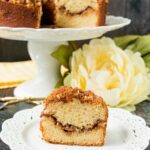 The topping is light and fluffy with warm toffee notes, and a hint of salt to awaken all your taste buds. This pumpkin pie is rich, creamy, and perfectly spiced. The crust is tender and flaky, and it’s all topped with a delicious caramel flavored whipped cream. Preheat oven to 425F and arrange a rack in the lower third of the oven. Set aside a 9″ pie plate. Sift the flour twice, then whisk in the salt and create a well in the center. Roll the dough out between 2 sheets of wax paper to about 11-12″ in diameter. It should overhang your pie plate about 1 cm. Fit the dough onto your pie plate. Fold the excess pastry underneath and crimp the edges. Whisk together all the filling ingredients and pour over the crust. Bake for 15 minutes at 425F, then turn down the heat to 375F and continue to bake for another 30 minutes or until the center is almost set. Cover with foil if the crust starts to brown too quickly. I covered mine during the last 15 minutes. Beat the whipping cream until stiff peaks form. Mix in the caramel and salt until blended. Spread over pie just before serving. 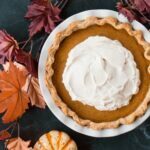 You can prepare the pumpkin pie a day in advance, cover and store at room temperature until ready to serve. The caramel whipped cream should be prepared the day of and stored in the fridge. Leftovers can be stored in the fridge for up to 2-3 days. You had me at Salted Caramel whipped cream! You’re very welcome and thank you for your kind words! 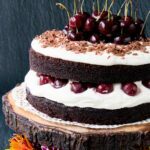 I have used your recipe a number of times and it always comes out great! I live in Australia, and they call butternut squash , “pumpkin”. I use roasted butternut pumpkin to make the puree, since I don’t find the canned pumpkin here. I’ve also had to make my own pumpkin pie spice! But this pie is so easy and tastes like home. Thank you. 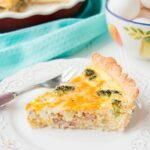 Do you pre-bake the crust for this prior to putting in the filling? I don’t like a soggy crust. Thanks! Thanks for your quick reply! Very helpful! Lily, this looks delish and so perfectly easy! But the caramel whipped cream stole the show for me! I’m gonna have to steal that idea, lol! Genius!! I know this might seem like a dumb question….but how did you do the pumpkin puree? I can’t believe it’s that time of year already! 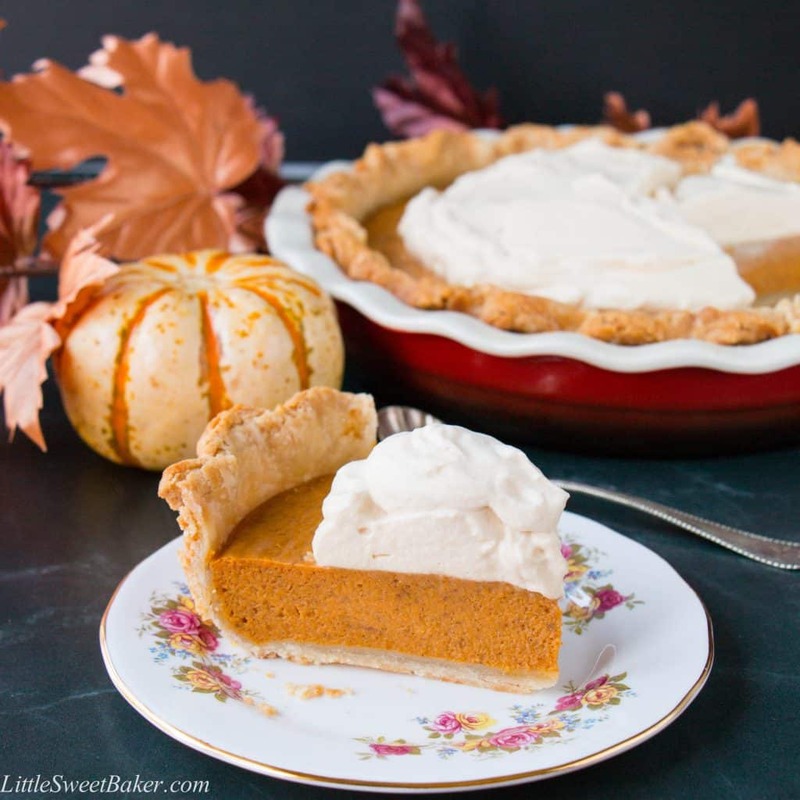 Pumpkin Pie is one of the best things about fall and yours looks amazingly yummy! I just love a good pumpkin pie Lily and this one looks amazing! I am such a sucker for pumpkin pie! The idea of adding salted caramel whipped cream to pumpkin pie is blowing my mind. Thank you for bringing this creative and delicious pie to Fiesta Friday!